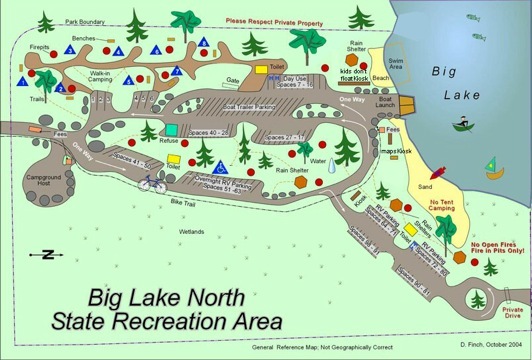 Sometimes called North Shore Campground, Big Lake North is the largest of the Bigs with more than 100 sites. The park features 8 walk-in tent sites, 2 Boat Launches with a dock, a swim area and beach, 4 pavilions, and 6 restrooms. Big Lake North also features a Camp Store stocked with ice cream, snacks, water toys, firewood, ice, and limited RV & Camping supplies. From mile 52.3 Parks Highway, take the Big Lake Road 3.6 miles to the roundabout, take North Shore Dr., drive 1.4 miles to the end of road where you’ll find the Park Entrance. 8. Large tent site suitable for 2 large tents or multiple small tents *This site is ADA accessible with ADA parking available. Parking Size; 9ft X 35 ft., asphalt, full afternoon sun. Picnic tables and fire ring. Parking Size; 9ft X 35 ft., asphalt, full afternoon sun. There are a limited number of picnic tables and fire rings. This is typically where we place larger parties or groups who have both tents and RV’s. Parking Size; 9ft X 35 ft., asphalt. Picnic Table and fire ring. Parking Size; 9ft X 35 ft., asphalt. No picnic tables and fire rings. For RV-Camper- Parking Size; 9ft X 35 ft., asphalt, morning sun. Parking Size; 9ft X 35 ft., asphalt, morning sun. No picnic tables and fire rings. HANDICAP TENT OR RV SITE: 56 If party has no disabled campers, they may be asked to relocate. For Tents- Large tent site suitable for 2 large tents or multiple small tents, morning sun. For RV-Camper- Parking Size; 9ft X 40 ft., asphalt, morning sun. Parking Size; 9ft X 35 ft., asphalt, morning sun, picnic table and fire ring. Parking Size; 9ft X 35 ft., asphalt, morning and evening sun. No picnic tables and fire rings. Access to picnic shelter, 1st come 1st serve. HANDICAP RV SITE: 72 Premium ADA site. If party has no disabled campers, they may be asked to relocate. Parking Size; 9ft X 35 ft., asphalt, morning and evening sun. No picnic tables and fire rings. Access to north end picnic shelter, 1st come 1st serve. 25.00 per night/per site. Premium Campsites are marked with a "P" Premium sites: 17, 18, 26, 27, 62, 63, 64, 65, 66, 67, 68, 69, 70, 71, 72, 73, 74, 75, 76, 77, 78, and 79, 80.